謝依儒 (Lulu) from Miaoli, Taiwan would like to tell about herself and share her experience of being a dual degree program participant. She is currently first year student of NSYSU GHRM program and a dual degree exchange student at Nottingham Trent University. She likes to travel and meet new people, discover new cultures as well as both gain and share experience. Lulu likes NSYSU for its friendly atmosphere and very supportive, caring Professors and staff, who are willing to help in solving any kind of problem and answer any question. Meanwhile, Lulu enjoys her student life at Nottingham Trent University - full of academic discoveries and new approaches combining it with experience of meeting people from all over the world (more than 80% of students in her class are international students) and exploring Europe - she already had a great chance to visit some of the European countries while participating in internship program. “NTU has a fabulous learning environment. Enjoy your time here and don’t hesitate to apply for dual degree program, it will be the most fantastic experience in your life” – Lulu advises to NSYSU students. Lulu would like to encourage students, whose native language is not English, not to be afraid, and challenge themselves to speak and practice as much as possible even if it is not very easy to express yourself at the beginning you will start to feel the language and the words will just flow. The same advice could be given to international students, who came to Taiwan and started learning Chinese. Although Chinese is not that easy for reading and writing but our speaking is quite easy without complex grammar. Chinese is full of our culture content so it is a way to learn local culture” explains Lulu. Spring, 2017, after one and a half year in GHRM, Grace Kuo (left) packed her belongings and headed to Nottingham Trent University, United Kingdom, ready for her dual degree studies in International Business MSc. Grace had never thought she would apply for the dual degree program, but after the result announcement of exchange studies, she decided to apply for the dual degree program in the UK and fulfill the graduation requirement at the same time. “It’s two birds with one stone. Why not?” She said. With the dual degree program at Nottingham Trent University, students are able to choose between two course routes, and Grace, who has tons of ideas, chose the innovation route. The way of how semesters roll in the UK is very different from how things go in Taiwan. All courses in each route are taught in “blocks”, in other words, one course in a period, intensively. “The loading of the studies there is actually heavy, although, with blocks, it is more efficient to absorb the information. After some time, it kind of feels like you're caught up with all the assignments and information load.” Grace brought up the importance of organizing time. To successfully get the degree, one can not enjoy themselves as if they are only doing a semester abroad, but with the heavy loading of studies, she improved self-management effectively and efficiently. To Grace, who chose to go abroad during the second semester of her senior year, making progress on her thesis is one of the most important objectives. 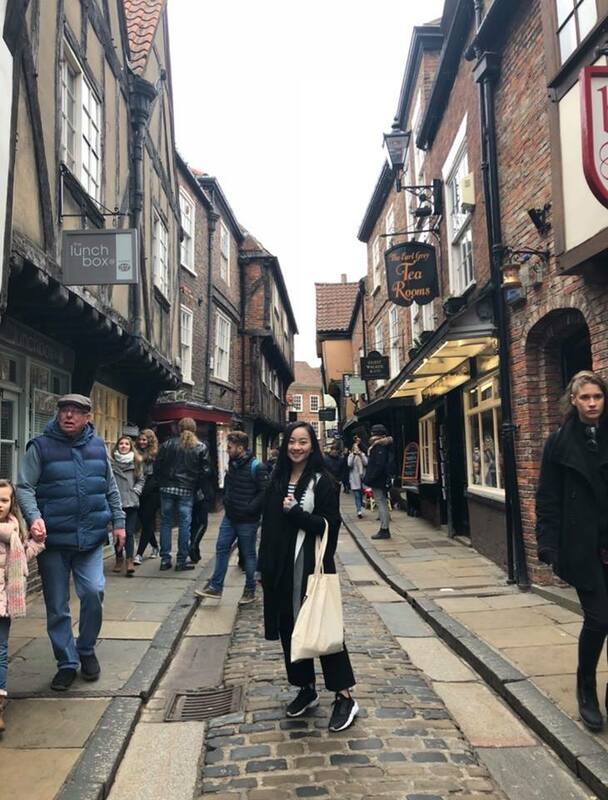 Without going on exchanging during the 3rd semester, Grace had already completed a part of her research, but to work with the schedule in Nottingham, she had to keep in contact with her thesis advisor in Taiwan despite the time difference. Furthermore, Nottingham Trent usually assigns a supervisor to each student to oversee their progress of theses. “The expenses in the UK is something one should pay attention to. A well-organized financial plan can be helpful.” Most local students support themselves with their part-time jobs, but if one is not planning to seek for part-time jobs, it is important to think thoroughly about how one can support themselves financially, in assuring the effectiveness of the studies while living abroad. Grace decided to cook by herself several days in a week, but for people who are not comfortable in kitchens, they can always go to the all-you-can-eat restaurants around the campus to let out their student instincts, eating! The experience in Nottingham Trent University is a windfall to Grace. She planned to seek for opportunities in the HR field due to her studies in Taiwan. “After my studies in the UK, I think there more opportunities ahead!” she smiles with ease, not limiting herself anymore.